Moving the amp from your test bench to the floor takes work, in this case negative work because the direction of motion is helped along by the force of gravity. If all this sounds strange already, just add this concept to the mix: work is independent of time. It takes a specific amount of work to lift your DR103 to the bench. It doesn't matter whether you jerk it upwards in a fraction of a second or take 20 minutes to lift it over the same path. It is the same amount of work. Question: a 30 kilogram tube amp would be how many kilograms on the moon? Answer: 30 kilograms. It turns out that a kilogram is a unit of mass. The force that we think of when we try to lift that parallel push-pull boat anchor is the mass times the acceleration of gravity, which happens to be 9.8 meters per second squared. When we multiply the number of kilograms by 9.8, we get the force of earth's gravity measured in newtons. The output transformer for your 60-watt push-pull amp weighs 6.6 pounds. When holding it in your hands, what is the force of gravity pulling it downward? Your vintage 6.6 pound output transformer is resting on the floor when you suddenly decide it would be perfect for your JTM45 re-issue. The top of your bench is 1.2 meters above the floor. How much work is required to pick up the transformer and place it on the bench? What if the transformer is sitting on the floor in the next room, which is 20 meters away? Lateral movement is not opposed by gravity and the transformer in the next room travels the same vertical distance. It therefore takes the same amount of work, 35 joules. Opposite charges attract. Like charges repel. If we move a negative electron towards another electron we perform work because we are moving against an opposing force. 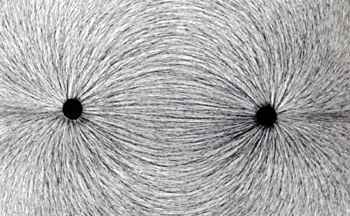 Moving two electrons toward two other electrons requires more work because there is more opposing force. We often need a convenient way to describe how much work is required to move charge from one point to another. That concept is voltage. Since W and Q can be positive or negative, it stands to reason that V can be positive or negative also. It takes 1.6kJ (or 1600 joules) of energy to move 1x1020 electrons from the plate supply (Point A) through the plate resistor to the plate (Point B) of your JTM45 preamp. (Notice that this is opposite to the actual electron flow.) What is the voltage V across the resistor? Thus there is a drop of 100 volts across the resistor from the plate supply to the plate. It takes you 2 seconds to steadily lift your 6.6 pound output transformer from the floor to the top of your bench, a total vertical distance of 1.2 meters. What is the average amount of power you are expending as you lift it? where the variable "I" is used to denote current. When I is in amps and V is in volts, then P is in watts. A steady current of 11mA flows through a Fender Bassman 5F6-A choke when no guitar signal is present. The choke is not a perfect inductor, because its internal windings have DC resistance that causes a 1.2 volt drop across it. How much power is the choke giving off in the form of heat? The 47-ohm cathode resistor in the power amp of your Vox AC30 is rated at 10 watts maximum power. At idle the voltage across it is normally 10 volts. What would the average current through the resistor need to be to produce 10 watts of heat?